Andreas Neocleous was born in Paphos, Cyprus. He is the founder and managing partner of Andreas Neocleous & Co LLC. 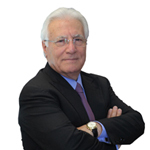 Mr Neocleous graduated in law from Athens University in 1964 and was admitted to the Cyprus Bar in 1965. He is a former member of both the Cyprus Parliament and the Cyprus Bar Council and is currently a member of the Cyprus Bar Association, the International Bar Association, the Mediterranean Maritime Arbitration Association (vice-president ) and the International Academy of Tax Advisors. He is also a member of the International Tax Planning Committee of the Cyprus Bar Association and the Congress of Fellows of the Center for International Legal Studies and is the National Reporter for the Foreign Lawyers Forum of the American Bar Association. He is listed as one of the top International Tax Lawyers in Euromoney’s International Tax Experts Guide. Chambers Guides lists him as a senior statesman of the legal profession.